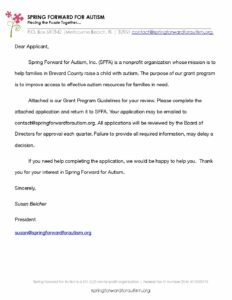 Grants are designed to provide access to individuals and families in Brevard County, Florida affected by Autism Spectrum Disorders. Grants will be allocated on a quarterly basis based on annual fundraising activities. The Board of Directors will determine how many and the amounts of each grant at the beginning of each term. Applicants will need to apply each year for assistance. 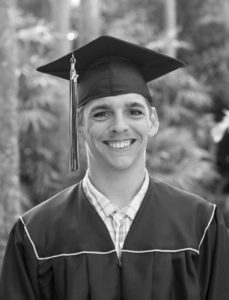 Grant approval may be expedited for applicants that are in immediate personal danger or harm, as we will try to provide immediate support based upon the need and the funds available within our grant program. Once determined how much we can award each quarter, the board will review the following items when considering approval of a grant request. 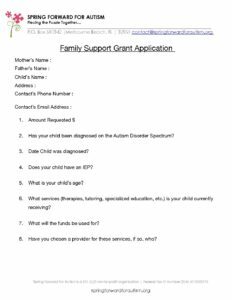 Completion of grant application – Applicant can fill our application at www.Springforwardforautism.com or request an application to be emailed to them for print. The application must be completed in its entirety to be reviewed. 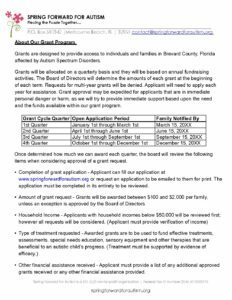 Other financial assistance received – Applicant must provide a list of any additional approved grants received or any other financial assistance provided. Required Volunteer Service – Grant recipients are required to complete a minimum of 4 hours of volunteer service with the organization within the first twelve months.